Will there be an Ice Age Tax? Today it's known as the Maunder Minimum, it occurred between 1645 and 1715, during a longer span of time when parts of the world became so cold that the period was called the Little Ice Age, which lasted from about 1300 to 1850. Though it's not progressive to bring this up. The determining factor on how much global warming we experience in the climate is THE SUN. If the sun throws less energy out, the climate cools. I'm sure that if we see another ice age develop that a tax will be proposed that will encourage the Sun to shine brighter. It will reward countries for generating carbon rather than reducing it, encouraging the promulgation of more CO2 in the atmosphere rather than less, and naturally, more tax. Pagans (sun worshipers by nature) will likely burn more wicker men - more Burning Man festivals in the summer and more wicker deer at the Winter Solstice being burned to try and encourage the Sun to burn hotter. But all of the naked pagans running around the Black Rock desert may need to put some clothing on to keep warm. ice age, or none of the above (just large waves)? 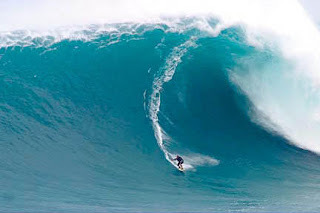 Meanwhile in Hawaii, I have heard that the large winter waves smashing into the volcanic islands are due to -- wait for it -- global warming, because some of the waves are the largest recorded since they put out wave buoys to record them. I spoke to an airhead student attending the University of Hawaii, who was also watching the surfing completion at Sunset Beach. She brought up her personal efforts to stop global warming, impressing me with her learning and earnest efforts to save the planet. When I suggested that we may be heading into an ice age, she told me that she'd heard that but scientists don't think that it would last that long. I asked her how scientist knew that it would be a brief ice age, because past ice ages lasted tens of thousands of years. Relying on current folklore, she said, "global warming will stop it". She should run for Congress. She's a big fan of Alexandria Ocassio-Cortez. Looking at other stars similar to ours, they have extrapolated how long the solar minimum might last. All those guys have PhD's and nobody has a clue. For the record, neither do I, but I can predict a new tax.